Will Lane Founder Emily Soong sits down with Lisse Grullemans to discuss the latest collaboration. LG: This is such a unique piece that’s come out of an amazing partnership. Can you tell us a bit about how the collaboration began? ES: Of course! It was actually really organic, which feels ‘right.’ It all came from a chance encounter this summer with a woman wearing a classic black satin bomber jacket with "BY WAY OF DALLAS" written on the back. I’ve always loved this style, they’re reminiscent of varsity athletic jackets and baseball bomber jackets for me - both classic American staples. But I also immediately connected with those words “By Way Of.” Turns out, the woman in the jacket worked for the brand and she was all for getting a collaboration going. It felt like kismet! LG: So, Will Lane is based in NYC, not Dallas. How did that inform the look and feel of the piece? ES: Right, totally. The words "By Way Of Dallas" spoke to me because they're a visible and direct acknowledgement of where one comes from. To me, the person wearing the jacket was stating their identity loudly, clearly, and confidently. With any geographic identification, there are always mental & emotional associations with certain places -- this is especially true for NYC. In my early vision, I knew I wanted to create something with that strong identity. When I specifically think about downtown culture, I think of graffiti and street art. I wanted to make something for the woman who embodies those non-conformist qualities. 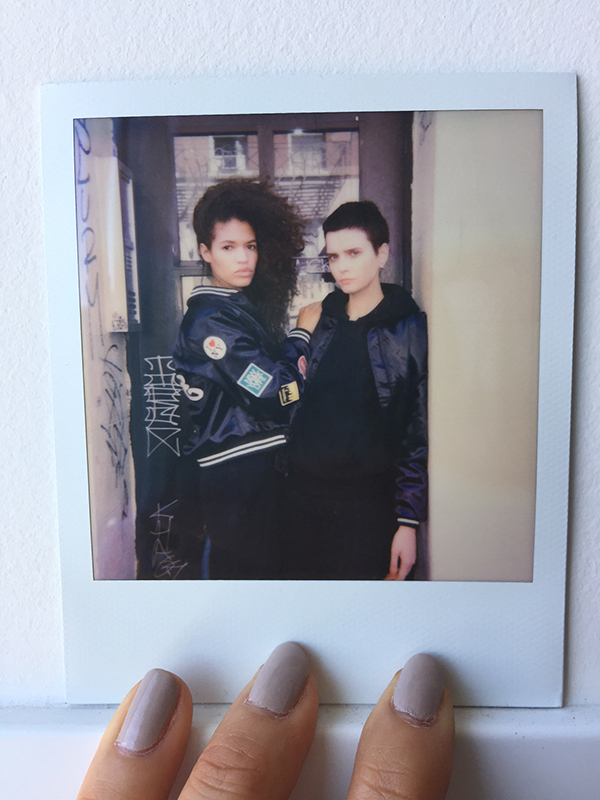 The collaboration uncovers the raw authenticity of NYC women embodying radical subcultures and differing perspectives. I also wanted to take something that seems classic, throwback, and from another era, and turn it on its head by adding atypical elements. LG: Let’s talk about that! There are so many cool things going on on this jacket and I know it was by the hands of many that this came to fruition. Who did you work with? ES: It's the result of a multi-artist collaboration for sure. The custom WILL LANE "hand style" was created by NYC/London-based artist and illustrator Chris Arundel. His style is so true to NYC. The collaboration process was wonderful - he created a series of hand-drawn styles that ranged in style, color, complexity / intricacy, design, lettering, and size. We went through a few rounds of narrowing down and eventually decided on one design, which is what you see now. I love that it’s reminiscent of Stussy's branded jackets, but it’s also so US. The custom sleeve patches were created by Hance Taplin from By Way Of. He had a really cool take on why we chose these iconic images so I’m just going to quote him because he says it so well: "Essentially, NYC is rooted with inspiration. There are so many easily identifiable elements that make up NYC and it's surroundings. I wanted to use easily identifiable elements that people normally recognize and put them in a different context. In this case a jacket." 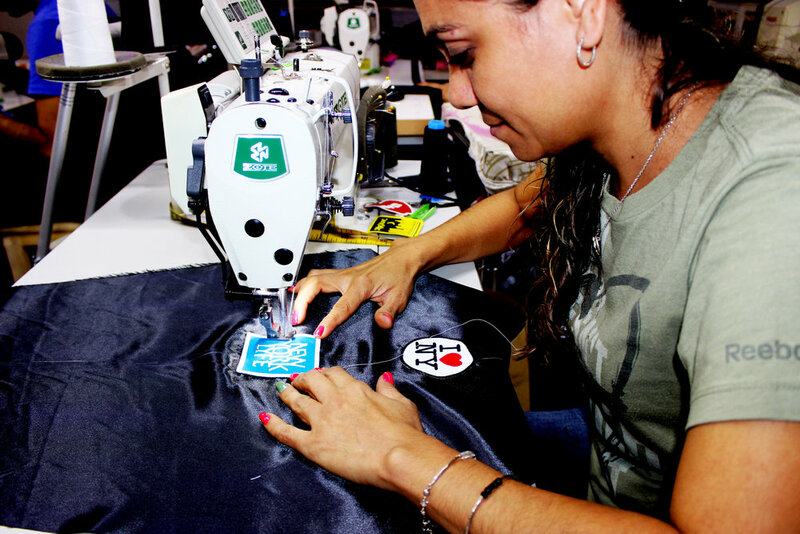 Isabel carefully sews the custom patches onto each sleeve. LG: Ok, last question but a fun one: ‘By Way Of’ as a phrase is something that so many people can identify with and internalize. What does it mean to you? ES: Technically speaking, I'm by way of New Jersey (born & raised there), but I also consider myself by way of immigrant parents, who are themselves by way of Taiwan. I'm by way of NYC by having found opportunity here after college. There was nothing more exciting to me than chasing after my dreams in the big city! WILL LANE is by way of New York - born & bred here.